We’d love your help. Let us know what’s wrong with this preview of Last Day on Mars by Kevin Emerson. It is Earth year 2213—but, of course, there is no Earth anymore. Not since it was burned to a cinder by the sun, which has mysteriously begun the process of going supernova. The human race has fled to Mars, but this was only a temporary solution while we prepare for a second trip: a one-hundred-fifty-year journey to a distant star, our best guess at where we might find a n It is Earth year 2213—but, of course, there is no Earth anymore. Not since it was burned to a cinder by the sun, which has mysteriously begun the process of going supernova. The human race has fled to Mars, but this was only a temporary solution while we prepare for a second trip: a one-hundred-fifty-year journey to a distant star, our best guess at where we might find a new home. To ask other readers questions about Last Day on Mars, please sign up. This seems like an interesting story, but this book is considered middle-grade on Amazon, and I'm 22. For someone who's read this book entirely, and preferably over 18, is it still an enjoyable read regardless? I'm 12 and have read The Last Day on Mars and is wondering if any of you know when the 2nd book will come out? Brierley Books #2 (The oceans between stars) & #3 (The shores beyond time) are out already. Enjoy! "And sure, we may not know yet what dangers are out there, but we also don’t know what good things we’ll find." This book changes from 'ugh' to 'wow'. For almost first half of the book, I was feeling like it was pushing me into the slump. But thank God, the next half was sooo amazing, I just couldn't stop myself from wowing. The blurb is amazing. That was the first thing which got me to read this. But the title attracted my attention at the first place though. Our Solar System is about to go KA-BOOM (no pun intended) by our Sun as it has begun the process of supernova. Earth has already become uninhabitable because of the our Sun. Humanity has to move to the Mars. But that's not even the permanent solution. It will just get them enough time to manufacture starliners which can get them to a very distant planet; Aaru-5. This planet is in another solar system and seems to have Earth-like features. "We’ll take it one unknown at a time." --The very shock I got from this book is: Time travelling. I didn't expect it a bit. It was very confusing at first. Very vague for me. It made sense as it progressed. --I also wasn't expecting that Liam and Phoebe would be left on Mars by them. This was the fact which made this book amazing for me. --All the space travelling here was amazing. We got to see Saturn too! Woow! I just couldn't stop myself from being amazed at this. How Liam drove the ship in its beautiful Ring! I loved those scene particularly. --The name of the series is 'Chronicles of Dark Star' and the name Dark Star is barely mentioned two to three time in the entire freaking book! I know it's just the beginning. But I couldn't stand it. I wanted more about Dark Star. --Characters are good. Liam and Phoebe are the best. Both are my favourite here. And robo-panda, JEFF was also great. Only he was the one who seemed little funny to me. --The biggest downside I found besides the slowness of almost first half is writing. I think it shouldn't have been that serious. Maybe the situation here wasn't favorable for humor. But still I think little humor wouldn't do any harm here. "The universe that you live in is really, really big. So big that most of the intelligent beings in it have had to make peace with how much they will never see and never understand. And yet that’s only the beginning." I’ll often get what I’d call reference interview questions from the internet as a whole. They come in via Twitter, Goodreads, personal emails, my website, my blog, you name it. In one recent case a parent told me that her 10-year-old son had recently devoured the rather adult The Martian by Andy Weir. She wondered if I had any recommendations for him (not on the adult side of things – just in general). So let’s break that request down. You have a kid that’s a good, advanced reader, capable of c I’ll often get what I’d call reference interview questions from the internet as a whole. They come in via Twitter, Goodreads, personal emails, my website, my blog, you name it. In one recent case a parent told me that her 10-year-old son had recently devoured the rather adult The Martian by Andy Weir. She wondered if I had any recommendations for him (not on the adult side of things – just in general). So let’s break that request down. You have a kid that’s a good, advanced reader, capable of complex storytelling, nuanced prose, and exciting science fiction elements. Oh. And you have Mars. If you wanted to go entirely on the speculative rather than the scientific side of things you could pull out Ray Bradbury’s The Martian Chronicles but somehow I was pretty sure that wasn’t what the kid was looking for. Enter Last Day on Mars by Kevin Emerson. I don’t like to say of any book that “it’s got everything” but it’s certainly jam-packed, that’s for certain. Saboteurs, exploding stars, theft, explosions, near escapes, and the constant knowledge that you are just one insignificant tiny life in the great blueberry pie of the cosmos. So to that young man I say welcome to the wide and wonderful world of middle grade science fiction, kid. You’re in for a heckuva ride. As every good schoolchild knows, in the far and distant future the sun is slated to burn itself out. Certainly we’ll all be long dead by the time that happens though, right? Unfortunately by year 2179, it becomes pretty clear that the sun has, for some mysterious reason, fast-forwarded the timeline. Earth is burning to a crisp and the only option is to find a new planet on a new star as fast as possible. Liam and his best friends have lived all their lives on Mars, knowing full well that the planet was just considered a pit stop before humanity hops on the big big ships and goes to places unknown. His best friend Phoebe, like him, is one of the last kids to leave since their parents are scientists responsible for terraforming the new planet. But when Liam finds the body of a dead alien, and a sudden explosion puts his parents in danger, it soon becomes clear that there’s something working hard to defeat humanity, and that this is bigger than anyone ever suspected. If Mars looms large in the public imagination, it looms a bit smaller in the imagination of children’s books. That said, in recent years I’ve seen an interesting uptick in books willing to take a trip to the red planet. The most notable of these was the British import Mars Evacuees by Sophia McDougall. Like this book, McDougall’s wasn’t afraid to go big with his premise. Once again the Earth is in danger from aliens, but in this particular case the damage has been done. Our sun is going supernova and there’s nothing we can do but work together and get everyone out into space, heading towards a planet that may or may not be hospitable. And since we are dealing with the first book of a series, I’ll tell you right now that Last Day On Mars has much more to do with the process of leaving than it does arriving. Save some details for the future books, after all. Do the great big gigantic ideas in this book work as a whole? I’d say so. Emerson introduces the notion of saboteurs fairly late in the game, and it can be confusing to have two entirely different groups of villains with two entirely different agendas working in different capacities throughout the story. Other than that, though, he keeps everything coherent with a nicely ordered chaos in the periphery. Of course, science fiction books for kids are hampered by one very important point. Mainly, that publishers don’t want to publish them. There is a general belief in the mainstream publishing industry that kids don’t want science fiction stories. And if there is a science fiction equivalent to high fantasy (high science fiction just sounds druggy) then they CERTAINLY don’t want that! The fact that any work of science fiction makes it out of the gate in the first place is, to my mind, always a mark of success on the author’s part. Look at you! You upended the industry hive mind and managed to convince them to publish you at all! Well done! Now let us, in turn, consider the young science fiction reader. This would be a child that gravitates towards possibilities. Part of what I like so much about Last Day On Mars is the playful way it toys with expectations right from the start. In the Prelude we are asked to think about a map and a creature studying the map, but the author keeps making it clear that the best our little human brains can do is make rough estimates as to what these would look like. As things progress and the reader is met with more impossible ideas, the book takes a step back and says, “Put it this way: If reality was a blueberry pie . . . you are so small and so far inside your own blueberry that you can’t even tell it is a berry in the first place.” And what’s remarkable about this sequence is how quickly it passes. As an author, Emerson is capable of introducing great, grand philosophical musings one moment and then tuck them into an old-fashioned tale of good alien vs. bad alien just a couple pages later. In a way, it’s playing it every which way. The brainy kids get their brains. The mystery lovers their mystery. The action kids some good old-fashioned laser shootings. And for the reader that has never read a work of true science fiction before, they get something else. An intriguing start to a scintillating story. Genre is only as strong as its writing, though. In this, Emerson does pretty well. At the start I was a little worried that the three friends breaking the rules were too similar to the Harry Potter trio. Any children’s book with two boys and a girl is bound to feel like that, if only for an instant. What I didn’t anticipate was for one of the kids to go AWOL for the rest of the book and for the only girl, Phoebe, to not only be a risk-taker but also have a much more interesting backstory than you'd initially suspect. Our hero Liam is the most potentially problematic character, though. He’s the hero, a thankless role, and so I needed to see how Emerson would balance out Liam’s inclinations to do what is right and safe with his need, as a heroic character, to risk it all and take initiative. It helps that he gets his hands on some alien technology at the story’s start, but just handing your protagonist the right tools isn’t enough for a story. As a result, Emerson has to put Liam in situations where he is capable of seeing the consequences of inaction, forcing him to act. On the one hand this could potentially feel like a cheat. Our hero doesn’t want to take some of these risks, but that’s what comes of alien wristwatch technology. Then again, after Liam sees what has to be done he still has to figure out the details, summon his bravery, and make a bunch of last minute decisions where there’s no clear indication whether or not they’ll help or harm each situation. That Emerson manages to pull it off is a testament to the book’s strength. You would think with the prevalence of Star Trek and Star Wars and Avatar and other deep space epics that people would need to feed the demand kids have for adventures beyond the stars. That a book like Last Day On Mars comes out only once in a blue moon (ha ha) is cause for both speculation and celebration. Speculation because one wonders if the market for these books will increase (beyond the usual dystopian fare) in the future. Celebration because this book is awesome. Rip-roaring adventure, betrayals, big time booms, a witty villain (never underestimate the power of a witty villain), it’s got it all. I wouldn’t just hand this book to a science fiction loving kid. I’d hand it to any kid in general. Genre-defying, beautifully written, fictional fare. This was some super science fiction and a very fast read and I can't wait for book 2. Some things about it reminded me of the excellent Across the Universe trilogy--like being in stasis as your civilization zooms across outer space for decades to get to a new habitable planet and it only feels like a few days to you. The set up of it being the last day on Mars and everyone needed to get out on time was making me incredibly tense-what if they didn't make it out! I had to keep reminding myself tha This was some super science fiction and a very fast read and I can't wait for book 2. Some things about it reminded me of the excellent Across the Universe trilogy--like being in stasis as your civilization zooms across outer space for decades to get to a new habitable planet and it only feels like a few days to you. The set up of it being the last day on Mars and everyone needed to get out on time was making me incredibly tense-what if they didn't make it out! I had to keep reminding myself that if that was the case then they'd all die and there wouldn't be a book 2, so I should just settle down and enjoy the adventure. One of the things I appreciated about this was that although aliens, time travel, colonization, and space travel are all topics and have plenty of jargony words thrown about ("engage the thrusters!") it's all fairly breezily and simply talked about so that you can just accept zooming about among space debris without having to think too hard about the mechanics of it all. A smart, solidly written work of Middle Grade sci-fi. The book is aptly named; the vast majority of it taking place on a future Mars colony during the last day of its existence--just before it is due to be abandoned by humanity. The bulk of the story is told through the eyes of Liam Saunders-Chang, the young son of a scientist couple who are frantically attempting to perfect the teraforming technology that humanity will need as they flee the premature death of their solar system. Liam comes across as an otherwise "normal" kid for his time period--fond of sports, generally rule-following, confused over subtle shifts in his relationship with his best female friend, and fielding a love/annoyance dynamic with his angsty older sister. Liam's viewpoint presents a convincing generational divide. Born on Mars, he is having trouble mentally letting go of the only home he's ever known. At the same time, he has difficulty understanding the sad nostalgia his parent's generation has for the recently sun-seared cradle of humanity. Earth, to him, is just a series of videos, images, and ideas far removed from his everyday life. He is well aware the predictability of said life is about to be irreparably altered--but there is no way anyone could foresee how much his life will become directly intertwined with humanity's struggle for survival. The Last Day On Mars is refreshing--consistently inclusive of viable science-based details--without traipsing into tedium. The prose takes itself seriously, while still laced with a pleasant, airy sort of efficiency. Emerson offers an interesting prelude to set the tone of his work; this portion written in a past-tense, limited omniscient point-of-view that caters well to his audience without patronizing. Let's just call it a map. This map was in an office, (not exactly an office either, but close enough,) and its blinking caught the attention of a nearby being. She was known as a chronologist, and she was as similar to a human being as her map was to a human map, and her office to a human office. If you picture her having dark blue, somewhat translucent skin, and wearing black robes, that will be fine for the moment." Readers may need to be patient with the setup as Liam's big last day on Mars begins, but once the action eventually kicks in, the pacing is brisk. The characterization is sometimes a bit sparse, especially in terms of Liam's parents, who readers may have difficulty obtaining a realistic feel for. And for those who like a bit of stand-alone resolution in their reading... I'm sorry to report you won't find that here. The book ends with more questions than answers--essentially securing it as the start of a compelling series. So so SO disappointed. This was on my TBR for years. YEARS. I love space and I love the idea of discovering what else is out there. Then after all this time, Hubs got me the book for Christmas. Yay! Win, right?? I guess a part of the problem is that I genuinely don’t know who the book was written for. The main characters are like, 12, so it’s not really a young adult book, but the content and tech of it is way beyond what a 5th grader could read. Because the chara So so SO disappointed. This was on my TBR for years. YEARS. I love space and I love the idea of discovering what else is out there. Then after all this time, Hubs got me the book for Christmas. Yay! Win, right?? I guess a part of the problem is that I genuinely don’t know who the book was written for. The main characters are like, 12, so it’s not really a young adult book, but the content and tech of it is way beyond what a 5th grader could read. Because the characters were so young I had a hard time believing all that was happening, and they were so underdeveloped I just didn’t care. The only reason I finished it was because Hubs bought it for me and wanted so much for me to like it. Do you like futuristic sci-fi, aliens, and the idea of terraforming? Well then this book is for you! 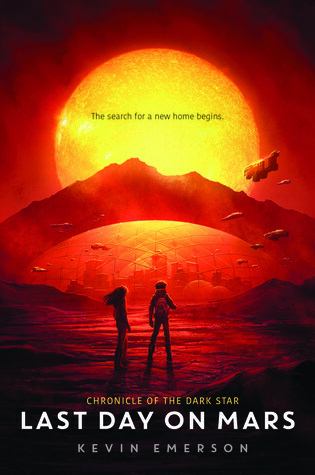 Last Day on Mars is a science fiction book about humans in 2213, when the sun mysteriously begins the process of turning into a supernova 4.5 billion years early, humans are forced to move to Mars until they can make a 150 year trip to Aaru-5, their new permanent home. Liam Saunders-Chang and Phoebe are son and daughter of the terraforming scientists. As their parents struggle to finish before Red Do you like futuristic sci-fi, aliens, and the idea of terraforming? Well then this book is for you! I recommend this book to 7th graders and up because of the elaborate plot, complex vocabulary, and whirlwind plot as the story , which sometimes literally flits in and out of reality. There have been a few books/series that i’ve read in the recent past that have centered around Mars, or space, or the notion that Earth can’t be the only planet for anyone to live on for much longer as a result of many many events. (YES, we are all very familiar with global warming, the effects that we’re having on the planet, the increase in severe weather etc). Anyhow, this story takes us on an interesting journey where there is so much that is unknown and so much that is uncertain, but it’s a There have been a few books/series that i’ve read in the recent past that have centered around Mars, or space, or the notion that Earth can’t be the only planet for anyone to live on for much longer as a result of many many events. (YES, we are all very familiar with global warming, the effects that we’re having on the planet, the increase in severe weather etc). Anyhow, this story takes us on an interesting journey where there is so much that is unknown and so much that is uncertain, but it’s also a time when unfortunately people can’t wait to be certain to make decisions. We’re teased at the very beginning of this story – even before the actual chapters start, with the notion that there are obviously far more intelligent beings out there, and those beings are able to not only show off their superior intelligence, but they are able to time travel to see what will happen and perhaps set themselves up to either change or benefit from the future. What’s even more interesting here though, and not entirely unexpected, there are different groups of these other beings that are absolutely not on the same side, and it’s because of their actions that things are put into motion. Yet the ‘humans’ are not aware of any of this and are the ones who will be on the receiving end of it all. So like the book summary said, we’re years in the future when Mars was colonized because Earth became nothing but a dried up desert that wasn’t able to sustain human life. Colonies were built and developed on Mars as a stopping point while researchers worked to find another suitable planet to relocate. The time on Mars isn’t a long one, perhaps 20 years or less, but luckily they’ve discovered another planet that seems like it could be ok, however they don’t have enough information on the geography, geology, etc of this planet to be sure. The luxury of time is against them as the sun is going supernova far faster than expected and off they go. Liam and Phoebe become our main characters, our heroes perhaps but the focus of the story no less. They are teens who are among the last to go to the starliner – a ship that’s going to take the entire population of the planet to their new home. As teens often do, they don’t listen, during critical times especially and when there’s an early arrival of a solar flare store, they steal away with a friend to watch it and they end up seeing more than they bargained for. In the form of an interesting structure that’s not on maps, and was never disclosed to anyone. That’s where this story takes it turn for drama. There’s no time to really find out what the structure is, yet there are so many questions. Liam’s parents, who are the key researchers with the task of ensuring that there’s the ability to create moisture and clouds to sustain life on the new planet, they don’t even know what this structure is and deem it his imagination. So no one knows what’s there and that means that the trouble that Liam and Phoebe got themselves into once is only just the beginning. The story feels like it’s pace quickens here – the timeline to departure has to speed up because the solar flare storms are getting worse and are occurring faster. Research is not yet completed and there’s no time to do so. there are catastrophes and damage being done on Mars that no one understands why and where that leaves us is with the death of a few key people, the departure of the Starliner without Liam, Phoebe and their parents, and so many open questions. Add to that, we encounter a pair of other beings that we think are human but are clearly not – who are working against the humans. Who have the intention to kill them all, and we don’t know who they really are and what their motivations are. Liam got a hold of a device that foreshadows death and harm, and these beings seem to trigger it, but Liam and Phoebe haven’t figured out exactly how to avoid all this. When they almost reach safety, it’s ripped from their hands. When they almost have a chance at survival, it’s also pulled away. We are left with so many questions on what will happen, who’s behind what, who can be trusted etc. And the LAST bit of this story – the Epilogue makes your jaw drop because something is revealed. A tie that links back to the saboteurs is raised and everything that we thought we knew, likely isn’t real at all. LAST DAY ON MARS was an entertaining read with young heroes, interesting twists, and adventure with humor and friendship weaved in. A great start to this new series with a lot more to come. I liked these characters from the start. They felt like regular kids and families trying to live as they can and survive their world ending. Literally. The teasing, friendship, and humor between Liam and Phoebe was spot on, as was the worry and stress they and those around them were under. The story starts of LAST DAY ON MARS was an entertaining read with young heroes, interesting twists, and adventure with humor and friendship weaved in. A great start to this new series with a lot more to come. I liked these characters from the start. They felt like regular kids and families trying to live as they can and survive their world ending. Literally. The teasing, friendship, and humor between Liam and Phoebe was spot on, as was the worry and stress they and those around them were under. The story starts off by steadily getting the reader acquainted with the characters and with the backstory while also going on a brief adventure with the main group of friends. As a reader, you can feel the level of intensity gradually grow as the story progresses until the action-packed end. Some characters were introduced, but I expect them to become more developed in following books where the villain's plot becomes more apparent. In the end, you're left wondering who can be trusted and what will happen next. In the end, was this what I wished for? This was an enjoyable story. I expect more character and plot development in future books as we learn more about what is going on. Perfect for Middle Grade readers and lovers of SciFi (and my 12-year-old son). Source: Received a complimentary ARC from the publisher through the tour host, which did not require a review nor affect it in any way. Well, well, well, what do we have here? LAST DAYS ON MARS is like The Maze Runner in the sense that it’s super-fast paced and each chapter ends with a mystery. Luckily, LAST DAYS ON MARS is way more focused and a lot of fun! I love the crazy premise and the whole mystery. I’m not much into series, but this one really caught my attention, and I can’t wait for the next one to come out! A lot of love for this novel. Only thing I wonder about is this: Is it middle grade or young adult? My brain kept bouncing between the two, but I think it’s middle grade trying to graduate to young adult. Maybe the tween characters will grow up to young adults and romance will float between them. Or maybe not. Regardless, excellent novel! Read it! It was a bit of slow starter for me but once it took off I was hooked. Liam and Phoebe are in way over their heads as all of humanity is racing the clock to get off of Mars before "red line" hour arrives. I love the action and the mystery surrounding the "watch" that Liam finds adds whole new dimension (literally) to the story. Lucky me that the second book is scheduled to be released next month! I’m normally not a sci-fi reader, but loved Andy Weir’s The Martian, so when some fellow teachers were raving about this one on Twitter, I thought I’d give it a shot. I was not disappointed. Protagonist Liam and his best friend Phoebe are the last kids on Mars, along with their scientist parents. The rest of humanity, having long vacated the now-destroyed-by-the-dying-sun earth, is aboard a massive spaceship ready to take off to an Earth-like planet in another solar system. Mars is next on the s I’m normally not a sci-fi reader, but loved Andy Weir’s The Martian, so when some fellow teachers were raving about this one on Twitter, I thought I’d give it a shot. I was not disappointed. Protagonist Liam and his best friend Phoebe are the last kids on Mars, along with their scientist parents. The rest of humanity, having long vacated the now-destroyed-by-the-dying-sun earth, is aboard a massive spaceship ready to take off to an Earth-like planet in another solar system. Mars is next on the sun’s to-be-burnt list, so the scientists have to quickly finish their terraforming project. Of course, things go awry, and the kids start to realize that the natural distraction of the sun and planets might not be so natural after all. Liam and Phoebe's families live on Mars because problems with the sun made Earth uninhabitable. Now, further problems are causing everyone to evacuate Mars and move to yet another planet. Liam has never really understood his parents' longing for Earth, but as he and his friends are spending their last days on Mars, he starts to get it. His parents are working at figuring out the final kinks in crucial terraforming plans, so he and Phoebe are waiting to get on the starliner. Of course, they think it a good idea to go out in a solar storm, and see a strange observatory-like building on a hill. They've never seen this before, and their parents don't know anything about it. When Phoebe's parents want her to travel into the tunnels and open a valve, Liam goes with her. Like good space kids, they wear their space suits and take along provisions, which is a good thing when they are caught in a quake. They barely survive, and Phoebe is injured. Luckily, they have enough communication left that Liam's robot, JEFF, manages to send out a skimmer to them. They are saved from falling off a cliff, but instead of going right back to base, they investigate the observatory and find a dead alien with a wrist device. When they do get back, things are very fraught, and it's unlikely that they will make the starliner. Liam's mother gives him an important data key, but he and Phoebe end up trying to catch the starliner with JEFF's help. Evil is afoot, however, and mysterious forces are working against Liam and Phoebe's attempt to catch up with the rest of the Martians. Strengths: This was a nice mix of Dystopian elements and space adventure. The explanation for why the group had to be on Mars, and why they had to leave, was well done and not belabored. The projects that the parents were working on sounded interesting; like with MINRS, I sort of wanted to know more about the community BEFORE everything started to go south. The frisson of romance with Liam and Phoebe was nice. This is clearly the start of a series. Weaknesses: Wasn't quite understanding the evil aliens and their plans. There were brief chapters devoted to explaining some of what they were up to, but I would almost rather have had that discussed briefly as they ran into the aliens. I enjoyed this book a lot. The setting and conflict are awesome. The technology's cool. The pacing for the last 2/3 is really good. Things keep going from bad to worse in a very edge-of-your-seat way. The voice in the prelude is fantastic. I did think the tiny bit of "romance" is completely unnecessary and felt forced, like it was added after some editor said, "Hey, Kevin, you need romance. Every book needs romance." But every book doesn't. This would have been stronger without. I personally don't I enjoyed this book a lot. The setting and conflict are awesome. The technology's cool. The pacing for the last 2/3 is really good. Things keep going from bad to worse in a very edge-of-your-seat way. The voice in the prelude is fantastic. I personally don't like science fiction with time travel / time manipulation. I know, I know: any sufficiently developed technology looks like magic. But...I just don't like even the appearance of magic in my sci fi. However, it's very popular lately to add time travel / non-linear time / time manipulation in your sci fi, so if you don't mind it you'll love this book. I certainly plan on reading more by Kevin Emerson. It’s a good book, but it’s really slow and I barely got through it. Very exciting beginning of a MG sci-fi series. I enjoyed how the parents and kids experience the events with different viewpoints and how these perspectives shape their actions. The twists near the end set the stage for an interesting second book that I look forward to reading. Liam feels like he's the only one sad to say goodbye to Mars. The adults all view Mars as just a layover on their escape from the Earth, or more exactly, the Sun as it is on its way to going supernova. Their end goal is a new home in a planet called Aaru in another solar system. Today is the day the last people will board the starship for their long journey there. The only one who seems to understand Liam is his friend Phoebe, another of the kids who was born on Mars. As they prepare to leave th Liam feels like he's the only one sad to say goodbye to Mars. The adults all view Mars as just a layover on their escape from the Earth, or more exactly, the Sun as it is on its way to going supernova. Their end goal is a new home in a planet called Aaru in another solar system. Today is the day the last people will board the starship for their long journey there. The only one who seems to understand Liam is his friend Phoebe, another of the kids who was born on Mars. As they prepare to leave the only home they've ever known, Liam and Phoebe are stuck on the last transport up to the starship because their parents are scientists finishing up the terraforming project for Aaru. But as the solar storms get worse and the time for the starship to depart draws near, things start to go horribly wrong, they stumble across some big secrets, and it is up to Liam and Phoebe to save the day. Once you get to Liam's last day on Mars the action and intensity of the book pick way up and I read the last 3/4 of the book in one sitting because it was impossible to put down. Liam and Phoebe's adventures on Mars make Mark Watney's headaches on Mars look like he's got it easy. They face emergency after emergency, and though sometimes when authors do that it can feel unrealistic, these all flowed together and made sense. It is quite the high octane read with plenty of mystery building and you finish the last page needing book two as soon as possible. Liam and Phoebe are both 13, so this is one of those middle grade reads that should also appeal to teens. If you have a preteen or teen who thinks reading is boring, shove this in their hands and see if they can bear to put it down after they reach page 90. The scifi fan in me loved this. Notes on contents: One moderate swear word. No sexual content. Two people are murdered, some others die in an explosion, and these are portrayed as serious but none of these is described in gory details. There are many other perilous situations that result in some injuries, but nothing gory. This is a fun, breezy, YA science fiction story filled with quick action, cliffhangers and surprises, an awe-inspiring science fiction future, a daring teenage protagonist, and a potential budding romance. For young teens, it might be the start of perfect science fiction series, and my rating reflects that. As an adult, though, I was turned off a bit by the conveniences in the plot: the lack of adult supervision, the many “I have a daring idea, let’s try it, it worked!” sequences, and the ease w This is a fun, breezy, YA science fiction story filled with quick action, cliffhangers and surprises, an awe-inspiring science fiction future, a daring teenage protagonist, and a potential budding romance. For young teens, it might be the start of perfect science fiction series, and my rating reflects that. As an adult, though, I was turned off a bit by the conveniences in the plot: the lack of adult supervision, the many “I have a daring idea, let’s try it, it worked!” sequences, and the ease with which the mystery is unraveled. But those are minor points that don’t really diminish the strengths of this book given its target audience. A story of the human race in the future. The sun is dying and the only way to survive is to run. Humans escape to Mars and are working on the science to form the needed ecosystem on another planet that they are preparing to inhabit. A conspiracy is unearthed behind the mystery of the dying sun. The future and present lies in the hands of a young boy, his best friend, and family robot (who resembles a giant panda bear). Bought this one for my son, based solely on the cover. Space mad that he is, and I read it with him for a school project. Supposedly written for the middle reader bracket, but overly complex writing that the middle reader bracket will struggle to wrap their heads around. Not the easiest plot to follow, and not always the most understandable. I didn’t enjoy it as much as I had hoped. There is another book that follows on but we probably won’t bother with it. Disappointed. If you're looking for middle grade science fiction, you should definitely check out this first book in the Chronicle of the Dark Star series. The good: This book offers exciting, fast-paced suspense. The warning: It might be a little too exciting before bedtime. Oops. I think it is a GREAT book for kids. It has some interesting characters and I wanted to know what would happen, but as with a lot of great books for kids, I was able to skim most of the action scenes and not miss much plot. I'm looking forward to hearing what some kids think of it. Picked this one from the SC JBAN list just so I could recommend it to middle grade boys this summer. I was not reading it for me. All I can say is wow. I was very surprised by the level of sci-fi "smart" in this kids' book. Pretty sure I'll recommend it to adult readers as well. This book was entertaining but a lot of technical descriptions of flying drones, etc that I kind of started flossing over while reading. I enjoyed it, but not enough to continue with the series. The teens liked this one quite a bit, with the added bonus of the twist ending even had me by surprise. The science was very sound, and the world-building was great. I think I may read book #2 on my own! Great middle grade sci fi! Lots of action, intrigue and premise. The main characters, young teens, are regular kids with lots of heart and courage they didn't know they had. This is the first book in the series. Highly recommended for middle grade and up readers. This was such a great book. Unfortunately, it left me a cliffhanger! I have so many questions, but I will not share them because they are spoilers. It was so interesting. And I would recommend this book to anybody who is interested in science fiction. Although, this may happen to us in the future. This book sounds promising, but I'm getting confused with the beginning, can't imagine my best 5th grade reader bein able to fathom it either. It starts out like a high fantasy book, this can be a high sci fi book, a little technical and out of this world. Maybe I will get back to it later. Author of sixteen novels for children and young adults, most recently LAST DAY ON MARS, BREAKOUT, and the ATLANTEANS series. His books have been published in ten different countries. Formerly a science teacher and a creative writing teacher, Kevin is also a singer and drummer. He has won a spelling bee, lost a beauty pageant, and once appeared in a Swedish TV commercial.